The Cabinet sub-committee appointed to look into the recent petrol crisis, has found that the failure to maintain buffer stocks and the absence of a mechanism to carry out emergency supplies were the reasons for the shortage. The committee also raised doubts as to how the delay in the arrival of the two shipments – one ordered by the Ceylon Petroleum Corporation (CPC) and the other by the Lanka Indian Oil Company (LIOC) – and the breakdown of the refinery, all happened around the same time. Based on the committee report, Petroleum Resources Development Minister Arjuna Ranatunga had directed the CID to conduct an inquiry into this matter. Whatever the outcome of this investigation, it is not going to resolve the issue in the long run and it could be a matter of time before another shortage occurs. This is certainly an indictment on our current petroleum management system. The severe shortage of petrol, long queues at fuel stations which lasted nearly a week created much frustration among the masses. Irrespective of whatever the reasons behind, it talks volumes about the state of affairs in the energy administration in the country. Each party involved in the issue tried to pass the buck on to the other, while no one has taken responsibility for the crisis situation that arose. The immediate reason for the calamity was the rejection by the authorities, of a shipment of petrol meant for Lanka IOC, on the ground the product was substandard. 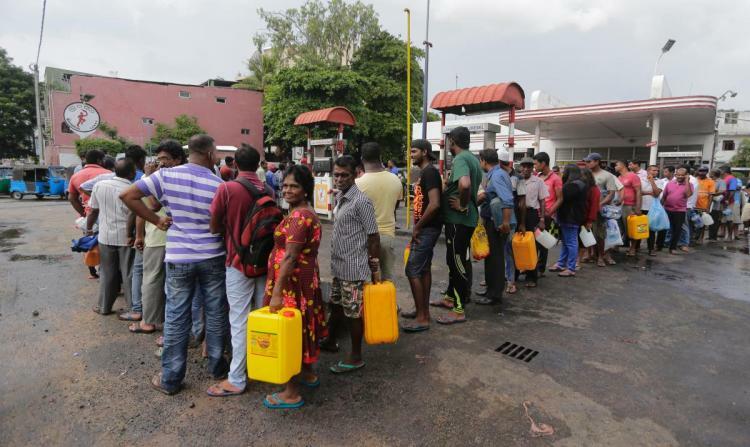 Spreading of this news resulted in panic buying of fuel increasing the daily average sales beyond the supply capacity of the Ceylon Petroleum Corporation (CPC) resulting in a shortage. Meantime, there have been allegations that officials of the CPC had failed to keep sufficient stocks to meet an emergency. Around the same time the stories about an inexplicable breakdown at the Oil Refinery at Sapugaskanda and political pressure to unload the substandard oils shipment etc. indicate the level of politics and possibilities of corruption around oil business. Now, much light has been thrown on these factors by the findings of the Cabinet sub-committee which looked into the matter. It is supposed to have recommended a regulatory mechanism to avoid repetition of such situations. The quantum of monies involved in these deals is such even in the past there have been enough and more allegations of corruption involving politicians handling the subject, directors as well as high officials of the CPC. We have also witnessed the disastrous effects of substandard petrol being imported and released to the market and how government had to pay compensation for the damages caused to vehicles. There are also conspiracy theories and possibilities of sabotage etc. to make the current government unpopular in the face of highly probable local government elections in the near future. Despite these possibilities what is clear is that there is a serious issue in managing the petroleum industry in the country. There are doubts as to whether country has gained anything by nationalizing the petroleum industry in 1961. At the time the government had no involvement in the petroleum business. Market was controlled by Shell while Esso and Caltex had relatively smaller market share and import, storage and distribution went on smoothly. Nationalization of the industry would have been inevitable because of the need for the state to control the commanding heights of the economy in terms of the political thinking at the time. But the question is whether we have gained much out of it. Since the government takeover of the petroleum industry the CPC continued as a monopoly till 2003. With unsustainable losses and other inherent issues normally associated with the government sector, the need for deregulating the industry arose and accordingly the monopoly of the CPC was ended with the formation of LIOC, a subsidiary of the Indian Oil Corporation being given nearly a one third share in the local petroleum market in 2003. Storage units in Kolannawa and Muthurajawela were made common user facilities by establishing a separate company called Ceylon Petroleum Storage Terminal Limited (CPSTL) with the joint participation of the Government, CPC and LIOC. Following the Petroleum Products (Special Provisions) Act passed in 2002 there were plans to have three players – the CPC and two other suppliers in the petroleum market along with a common storage facility. Accordingly, all arrangements were ready with 100 petrol sheds kept under treasury to be handed over to a third player who was to be picked on an open bid system. However, with political changes that did not happen and as a result the expected level of openness or competition has not been achieved in the market. Had that happened the real benefit of liberalizing the petroleum market would have been achieved with more players in the market and the government having to get involved only in quality control and regulating aspects. This would have been much similar to the situation that prevails in the telecom sector after privatization. If that had happened much of today’s problems associated with the petroleum market like what we have just witnessed and even threats of sudden stoppage of work will not be a problem for anybody. More over in today’s world it is foolhardy to think that potential foreign investors will come and operate in a country where the whole transport system can become inactive in a moment due to shortage of petrol and diesel due to wild cat strikes or whatever other reason. Therefore, the best way to have some energy security in the coutry and stability in the petroleum market would be to have a third player or more in the market and for the government to regulate it in an efficient manner. Even the current storage system should be re-examined because a central storage system also has its inherent weaknesses and it’s too much of a risk to depend on one entity for storage. Perhaps, it may be more practical to have more players with each one having its own storage facility. Building new storage facilities may be out of the question in present times because of the high costs involved. No private investor, foreign or local, will spend such a colossal amount of money, especially in an unstable environment with possibility of state takeovers and so on. The idea of putting the world war 11 era oil tanks in Trincomallee to some good use also becomes relevant in this context as it will also go hand in hand with this issue. If these tanks are utilized in a fruitful manner Sri Lanka will never have a domestic oil shortage and keeping such a buffer stock will ease our problems even in the face of a worldwide petroleum issue. So, the way out is to have a more open attitude towards the petroleum market with more players. Unfortunately with the latest fuel shortage for which the immediate reason appeared to be the low quality shipment ordered by the LIOC, interested parties have spread the distorted opinion that it is the privatization that created the issue. The strangest thing is that although the petroleum monopoly of the CPC is supposed to have been ended, 82% of the market is still controlled by them and LIOC has only 18%. In such a situation it is highly illogical to blame the small player saying that the reason for the shortage is the rejection of a shipment of theirs over a quality issue. In fact, in such a scenario the bigger player should be able to cash on the situation by releasing additional stocks to the market and increasing their sales. So it is clear that the real reason for the current unhealthy situation is the country’s inability to complete the liberalization process in the manner it was originally planned. If there are three or more players with nobody having the market control and a proper regulatory mechanism, there can never be shortages and that seems to be the only way to resolve this permanently. Only such a situation will protect the market from disastrous impacts of sudden shortages or work stoppages by employees of one player. However, because of the political sensitivities no government will be able to choose that path in the near future. But, if we are to resolve this issue permanently and lay the foundation for a stable economic future such decisions will have to be taken one day.